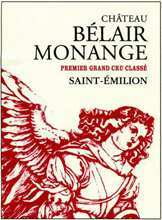 The first substantial and reassuringly great Belair-Monange in many decades, the 2008 represents the epitome of elegance and minerality. Its deep ruby/purple color is accompanied by sweet red and black fruits intermixed with notes of spring flowers and crushed rocks, a layered mouthfeel, superb nobility and remarkable intensity offered in a finesse-filled format. Kudos to Edmond and Christian Moueix for their resurrection of this iconic 6.2 acre vineyard. En primeur barrel sample. Formerly known as simply Belair, this has a bouquet that really draws you in: reticent at first and then gradually revealing sandalwood, chestnut, smoke and dried blood. The palate is medium-bodied, very well interwoven oak with good acidity. Very harmonious, this is not unlike La Serre although it is a little dry and foursquare towards the finish. It will be interesting to plot its progress after bottling. Tasted April 2009.